This week, through Author Buzz, I'm doing a book give away contest. I'm offering 5 prize packs of a copy of Depth of Deception as well as a commemorative Titanic Centenary coin. Anyone interested had to e-mail me with the name of a Titanic survivor. My e-mail inbox has quickly filled up over the last couple of days. Everyone has mentioned a Titanic survivor and the choices have been interesting. Margaret Brown (later referred to as Molly Brown) has been the most common choice - especially from contestants in Colorado. Second most chosen are Elizabeth Gladys Millvina Dean who was only two months old when she boarded Titanic and Charles Joughin, Titanic's cook who survived the icy waters because of the extraordinary amount of alcohol he had consumed in the ship's final moments. Others vying for a copy have gone the extra distance, some looking up survivors with their same names or survivors from their home town. One person even shared a beautiful Titanic poem that she had written. It's been an interesting way to connect with readers. Until then I am grateful for the interest that the book is getting. For anyone who has not had the chance to buy my thriller novel Depth of Deception (A Titanic Murder Mystery) yet, I wanted to let you know that I have something planned for this Sunday (April 15th 2012), which is the 100th anniversary of the sinking of the RMS Titanic. 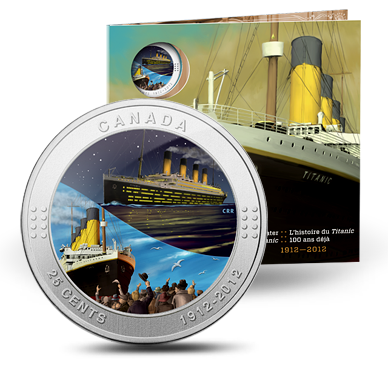 To honour the memory of those who perished on Titanic, we will donate a portion of the proceeds from that day's purchases of Depth of Deception to the Titanic Heritage Trust, which is a registered international charitable trustdedicated to preserving artifacts and the memory of Titanic. Synopsis: Depth of Deception is set in 1982, where a young woman isfound floating on a wooden deck chair in the North Atlantic. She's unconscious,and wearing Edwardian clothing. Her only identification is a ticket for the Titanic. Is it a bizarre case of time-travel or an elaborate hoax? For more information visit http://www.DepthOfDeception.com which contains a sample chapter, a synopsis, photos and a Bonus Feature page which includes a special 'Extras' section that can only be accessed if one has read the book and knows the password.